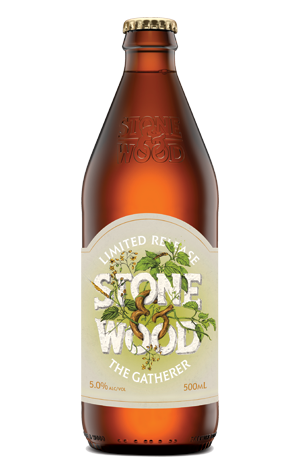 Last year, Stone & Wood launched a new seasonal series celebrating the brewery's home region in Northern New South Wales. It went by the name The Forager and launched with a witbier spiced with locally sourced coriander and bitter orange. They've since discovered another local brewery had used the name Forager for a beer a while back, hence renaming theirs as The Gatherer from now on. Minor background tidy up over, what does it mean on the beer front? This time around, the base is an American wheat beer (in other words, featuring a fair whack of wheat in the grain bill but with a "clean" yeast that won't contribute the spicy or banana like qualities typical of Belgian or Bavarian wheat beer yeasts). And the locally gathered additions are watermelon, cucumber and mint – a combination you might expect blended in a glass with your breakfast in Stone & Wood's hometown of Byron Bay. They're joined by Aussie hops Helga (soft and spicy) and Galaxy (tropical and fruity), the result of which is a hazy, pale yellow beer in which everything is served up with subtlety; we picked up more of the watermelon and cucumber in the aroma, the mint to taste. There's some malt sweetness and citrus on the nose too, while it's lean, dry and delivers a delicate, spicy finish.